Avout supports Bicycles for Humanity through its involvement with 1% for the Planet and we are super excited about its growth and success over the past year. B4H Colorado has opened two new bike shops in Mbita, Kenya and Lusaka, Zambia. 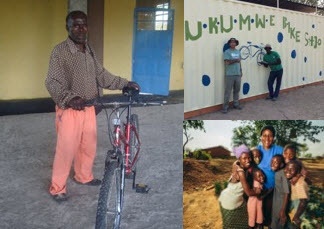 Read their latest newsletter for inspiring stories about how bicycles help rural communities, updates on their existing shops (the first one opened in Nkurenkuru, Namibia in 2009! ), and a shout-out to Avout and Avout Racing. Also, save the date for their Fall Gala on November 4th at Balistreri Vineyards in Denver. Avout and Avout Racing will be there!